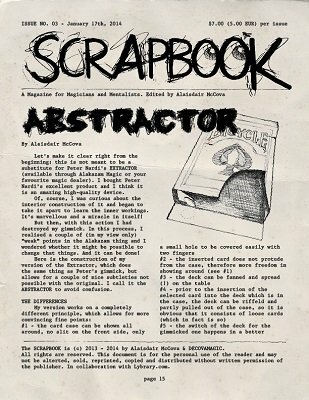 ABSTRACTOR - My take on the "Extractor" gimmick which is completely different. The deck can be fanned, spread and quite freely shown. The spectator himself can insert his card into the case. The case is shut and rubber bands are placed all around the case (!). You can show the case from all sides - all looks perfect. You put the deck in your pocket and immediately have the selected card at your disposal! Easy to construct in less than half an hour with only one deck used. TAMARIZ MEMO DECK - Here I start with a five part "course" on the memorization of this brilliant stack. It's fun to read, even more fun to learn and above all: after only five sessions you will know the stack by heart. I explain my method of assigning the numbers to the cards and vice cersa. Quite a few people here in Germany and Austria have used this method and were very happy (and successful). FLUKE II - A strong variation on a trick by Wayne Dobson. It is a sort of ACAAN effect and done with unprepared cards. No sleight of hand and you end with two perfectly stacked decks to continue. MAGICIAN's FOOLER - Try this one at the next session on your magic friends and enjoy the puzzled faces. A Tamariz routine done completely different, and maybe even the Master would be taken aback seeing it the first time (well, I didn't try it on him, but that fantasy sounds too good).